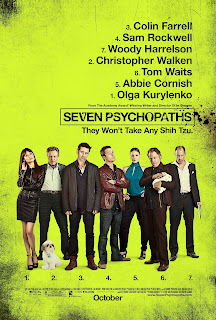 Tag line: "They Won't Take Any Shih Tzu"
When I first saw the trailer for director Martin McDonagh’s Seven Psychopaths, I couldn’t wait to see the movie. The thought of Colin Farrell, Christopher Walken, Sam Rockwell, and Woody Harrelson appearing in a film about psychopaths was too interesting to ignore, and I’m happy to say the movie is every bit as entertaining as I hoped it would be. 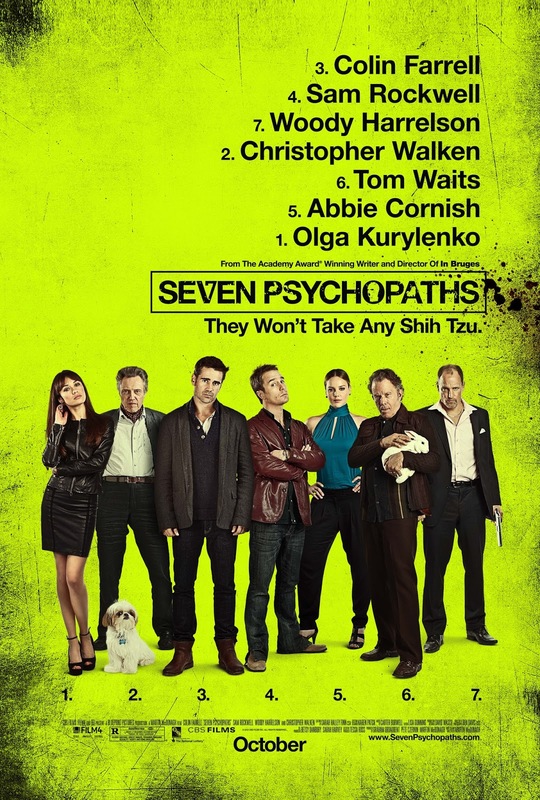 A humorous, sometimes poignant look at the lives of some very disturbed people, Seven Psychopaths is a whole mess of fun. Marty (Colin Farrell), a part-time screenwriter and full-time alcoholic, is working on a new project he’s tentatively titled Seven Psychopaths, and his good pal, Billy (Sam Rockwell), wants to help him write it. Unfortunately, Billy, who runs a dog-napping operation with his partner Hans (Christopher Walken), has just kidnapped a Shih Tzu belonging to Charlie Costello (Woody Harrelson), an insane local mobster who will stop at nothing to get his beloved canine back. Before he knows what’s hit him, Marty is mixed up in the whole sordid affair, and tries his damnedest to make sense out of what is quickly becoming a dangerous situation. McDonagh assembled a great cast for this film. While not one of the titular psychopaths, Colin Farrell gives a frantic performance as Marty, who, at times, is the movie's sole voice of reason. Woody Harrelson is superb as the mob boss out to recover his dog, and musician Tom Waits, clinging to a bunny rabbit, proves the most fascinating of the real-life psychopaths, a man who, years earlier, teamed up with a woman named Maggie (Amanda Mason Warren) to rid the world of serial killers (his back story “solves”, among other things, the Zodiac killings as well as the WWII-era Arkansas murders that inspired The Town that Dreaded Sundown). One of the seven psychos, a former soldier with the Viet Cong posing as a Catholic priest (Long Nguyen), exists only as a character in Marty’s screenplay, yet that doesn’t make his story any less engaging (as written by Marty, this character decides to exact revenge on the U.S. following the murder of his family, who died as a result of the massacre at My Lai). The standout performances, however, are delivered by Christopher Walken and Sam Rockwell, the dog-nappers whose tactical error leads to all sorts of chaos. In spite of everything that happens to him, Walken’s Hans remains subdued, even reflective, throughout the entire film (he only loses his cool once, when Marty suggests they go to the police for help). As for Rockwell’s Billy, he’s easily the most unhinged character in the movie, yet his upbeat personality also makes him the most likable. In a picture filled with twists and turns, these two are responsible for some of the biggest surprises. Martin McDonagh is a filmmaker you’ll want to keep an eye on. Prior to Seven Psychopaths, he helmed the massively entertaining In Bruges (his directorial debut), and now that he has two excellent movies under his belt, I’m chomping at the bit to see what he comes up with next. Wow, this looks awesome, thanks for the reco!!! Dave, this is totally off topic (as I have not seen the film). However, I have given you a blogging award. Oddly, I liked this film. I did not expect to like it, but I did. The screenplay was flawed, but playful, and ultimately worked. I thought the movie was a worthy effort.